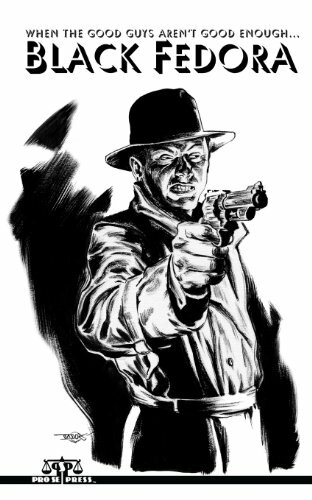 Pro Se Productions, known for innovative Genre Fiction and New Pulp, throws the spotlight on those in the shadows, the other half of every great story- The Villain-in BLACK FEDORA, the company’s latest digest anthology. Welcome to the dark side. BLACK FEDORA holds stories where the hero is the villain and one person's crime is another person's glory. Get ready to step out of the light and take a tour of various underworlds with three tales that give a steely-eyed look at what secrets lurk beneath the BLACK FEDORA. This exciting anthology consists of tales by B. C. Bell, Phillip Drayer Duncan, and Kevin Paul Shaw Broden and a stunning cover by the best Pulp Artist today, Douglas Klauba! Edited by Brad Mendel and Mark Beaulieu with cover design and print formatting by Sean Ali and Ebook formatting by Russ Anderson, BLACK FEDORA is so good it's criminal. From Pro Se Productions, the leader in cutting edge New Pulp and Genre Fiction. Get your print copy of BLACK FEDORA at Amazon and or at Pro Se’s site at http://prose-press.com/pro-se-store/. The volume is also available as an Ebook at Amazon, Barnes and Noble, and in nearly all formats at www.smashwords.com. If interested in Digital Review Copies, interviews with the authors and/or the publisher, or other information, please contact Morgan Minor, Pro Se Director of Operations, at MorganMinorProSe@yahoo.com. B.C. Bell writes Crime, Horror, Science, and Pulp Fiction. His short story “How Pappy Got Five Acres Back and Calvin Stayed on the Farm,” is an SFReader.com Award Winner. His first novel, TALES OF THE BAGMAN is a roaring 1930’s pulp thriller about a mobster forced to don a mask. His latest, BIPOLAR EXPRESS is the story of mentally ill men trying to survive, sometimes humorously, sometimes savagely in an abandoned city as the magnetic poles switch. Bell has written adventures for many pulp heroes, including The Avenger, Secret Agent X, and Dan Fowler G-Man. Bell lives in Chicago (and occasionally shows up for readings). Look him up on Facebook (http://www.facebook.com/B.C.Bell.Writes) or his blog (http://www.chicagobagman.blogspot.com). http://www.PhillipDrayerDuncan.com or find him on Facebook and Twitter. Kevin Paul Shaw Broden, while seeking a career in comic books, took art courses throughout his education only to eventually discover that no matter the media he was a storyteller. Kevin has been telling stories ever since. For over the last ten years Kevin has been illustrating and co-writing the online comic book FLYING GLORY AND THE HOUNDS OF GLORY which can be found at http://www.flying-glory.com. His first novel was CLOCKWORK GENIE – a blend of fantasy, romance, and murder mystery. It was quickly followed by REVENGE OF THE MASKED GHOST – about a masked mystery man in the style of the 1930s pulp novels. Based in Batesville, Arkansas, Pro Se Productions is a leading independent Publisher on the cutting edge of New Pulp and Genre Fiction today. Genre Fiction, particularly that written in the Pulp Style, is known by many names. Fiction featuring action and adventure, fast paced, larger than life protagonists and antagonists, over the top characters and tight, yet extravagant plots, is experiencing a resurgence like never before. And Pro Se, publishing New Pulp and Genre Fiction since April, 2010, is a major modern force in the revival. Specializing in prose books, anthologies, magazines, audiobooks, and more, Pro Se has made a commitment to 'Put the Monthly Back into Pulp' and continues to do that successfully, producing at least one new work every month. Pro Se is an innovator in the Genre Fiction market, continually refining its presentation and product and working on exciting new veins of New Pulp to bring to readers and fans of all ages everywhere. COVER ARTIST RAYMOND LEONARD JOINS PRO SE!